Well, there aren’t exactly a heck of a lot of matters that need attention in the “Horticultural Matters” department these days other than tending to giant tropicals that are waiting for the warm spring day when they can escape to the great outdoors. So ever since the big freeze I have been entertaining myself by reading and sometimes re-reading a few of the plant books that I have collected over the years. Palms Won’t Grow Here (and other myths) by Dr. David A. Francko is the book that has inspired thousands of northern gardeners to ignore common sense and embark on the great adventure of growing tropical plants in colder climates. Written while he was a professor of botany at the not-so-well-named Miami University (which is actually in the frigid state of Ohio) Francko describes his zone-defying experiments in excruciating detail as he identifies the specific species of figs, palms, banana plants and other exotics that can survive outdoors through a harsh northern winter. Many of his recommendations probably wouldn’t work in the wild and woolly north of Barrie, but here in Toronto, many fearless gardeners (myself included) have had great success growing Japanese fibre bananas (Musa basjoo) as a die-back perennial using micro climates, a lot of mulch and plenty of optimism. As far as reference books go it’s hard to compete with the girth and tonnage of The Firefly Encyclopedia of Trees and Shrubs. Coming in at about a thousand pages, this attaché case-sized book even has its own carrying handle to lug it about. It’s a favourite among arbourists and shrubbery types as one of the most comprehensive reference volumes for both Canadian native species as well as an extensive assortment of more exotic and unusual trees and shrubs found in other parts of the world. The detailed and descriptive text packed into the book’s pages might be a bit on the microscopic side but it’s impeccable images make it well worth the price of admission. What’s an ‘etymologist’? Well, first off, it has nothing to do with ‘entomology’ (the study of insects) and secondly, I have been itching to slip the word into a column for about five years now. 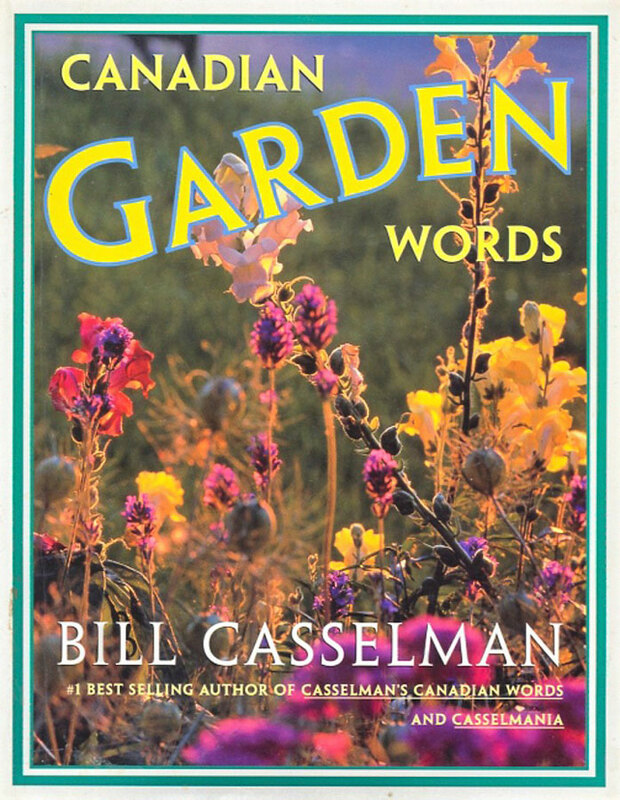 The term etymology is defined as the linguistic study of the history, origin and meaning of a particular word – and in his book, Canadian Garden Words, Bill Casseleman proves he is one of the masters of the sport. As a humourist, broadcaster and yes, etymologist, Casselman is no stranger to dissecting and deconstructing words as demonstrated in his other books Wacky Canadian Words and Sayings and Casselmania. This time he targets plants and investigates the sources and genealogy of their common and botanical names with forensic enthusiasm, with a good helping of bizarre folklore and side-splitting sarcasm thrown in to keep things interesting. Who knew that orchid and avocado came from words that once described certain private parts, and daisy originated from the Old English daeges eage which means ‘day’s eye’ For all you fellow etymologists, glottologists and plain old wordsmiths out there, this entertaining book might just make you think differently about the names of virtually every flower, vegetable and tree you might come across in the garden. Of course the winter reading list isn’t all about trees, shrubs and flowers, and I have to admit I occasionally wander off into an Ozzy Osbourne biography or take a few laps around Mark Lewisohn’s mammoth first instalment of the Beatles story. But unlike Ozzy’s paperback or the latest James Patterson thriller, plant books have a long shelf life and are evergreen – and they probably won’t be ending up in the curbside ‘free’ box anytime soon.